Monument Valley Navajo Park is one of the most widely recognized regions of the American West, thanks in part to Hollywood. More Western movies have been filmed here than in any other location in the United States. 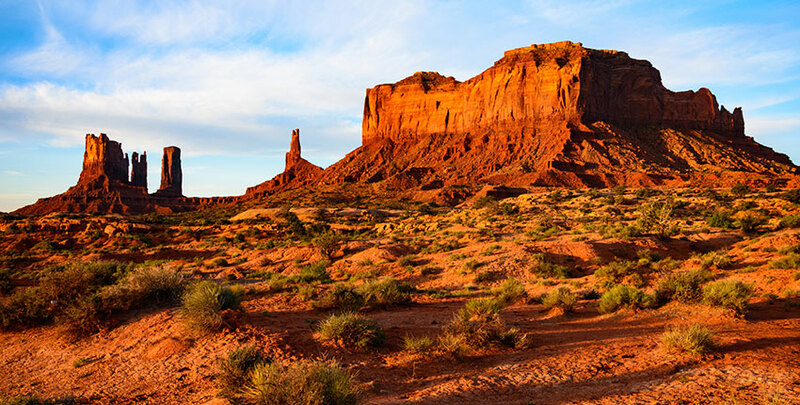 Vast expanses of flat, red desert punctuated by towering buttes and sandstone formations distinguish Utah's Monument Valley. This amazing valley is home to sandstone masterpieces that range in height from 400 feet to over 1,000 feet viewable by scenic drive tours and hiking trails. Where can I get the best views of Monument Valley? I would love to go hiking, where is the best area for hiking? The Wildcat Trail is the most popular path for hiking. The trail is 3.2 miles long and takes approximately 2 hours to walk. Monument Valley is one of the most photographed areas of the country offering beautiful views of majestic rock formations, like Tower Butte.